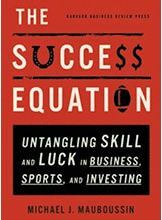 Michael Mauboussin, of Columbia University, and previously Chief Investment Strategist at Legg Mason Capital Management Inc. investigated this relationship between effort and luck in his book, The Success Equation. Mauboussin, an innovator in behavioral finance, adopted Harvard biologist Stephen Jay Gould’s “paradox of skill” to analyze the interaction of effort, skills, and luck, and best strategies to optimize outcomes in investing, sports, and career performance. He posits that as skill improves in activities where outcomes are affected by skill and luck, the standard deviation of skills narrows. For example, as investors become more sophisticated and have access to advanced computational tools, as athletes benefit from targeted training and development regimens, and as students are groomed for admission to top universities, differences among these skilled performers decreases. Chance influences can determine outcomes. To increase luck, he advises assessing each contender’s strength in the situation and finding “…something completely different to get you on the right side of the tail of the skill distribution,” such as employing an unusual or unexpected tactic. The stronger player has positive asymmetric resources, so the effective strategy is to simplify the game. In contrast the underdog should seek to complicate the game, such as through disruptive innovation, a flank strategy or a guerilla tactic. Because most people have a bias toward optimism and overestimate personal capabilities, it may be difficult to assess oneself as an “underdog” in a performance situation. Nobel Prize winner Daniel Kahneman and Amos Tversky explained that individuals who adopt an inside view gather substantial information, combine it with their own inputs, then project into the future without considering “distributional information” about a wide variety of previous instances. This approach risks developing an idiosyncratic, overconfident perspective by underestimating costs, completion times, and risks of planned actions, while overestimating benefits. In contrast, people who adopt the outside view consider the problem as an instance of a larger reference class and consider the entire distribution of outcomes when this type of situation occurred previously. This approach can reduce overconfidence. However, this approach could discourage entrepreneurs, who will realize that a small percentage actually succeeds. In addition, besides the bias toward overconfidence, people tend to “under-sample” instances of failure when a previously successful approach is applied in a new situation and doesn’t succeed. The Oakland As baseball team uncovered these principles in determining that a superior measure of athletic performance in this sport is on-base percentage rather than the traditional measure, batting average. In this case, on-base percentage has a higher correlation from one season to the next and a higher correlation with run production than batting average, fulfilling both criteria. Daniel Kahneman also suggested that skill, expertise, and intuition render more uniform results in a predictable environment. 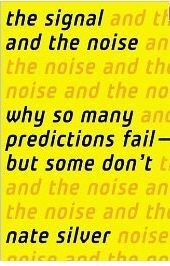 However, many organizational environments are unstable and non-linear, rendering experts less accurate because they cannot employ an effective predictive model. Collective judgments through “the wisdom of crowds” may mitigate the challenges of unstable contexts because they provide more data points. Mauboussin advocated considering the continuum of stability vs instability in which the issue is situated to determine strategy and to beware of applying simple heuristics that are vulnerable to bias, and social or situational influences. -*How do you optimize your performance when chance elements can affect your outcomes? This entry was posted in Behavior Change, Career Development, Thinking and tagged "wisdom of crowds", Amos Tversky, behavioral finance, Bias, chance, correlation, Daniel Kahneman, distributional information, inside view, Luck, Michael Mauboussin, Nate Silver, outside view, overconfidence, Performance, perseverance, predictive value, Samuel Goldwyn, skill, Stephen Jay Gould, thinking errors, Thomas Jefferson, unstable environment on April 22, 2013 by kathrynwelds.